Chris Monaghan is a Senior Lecturer in Law at the University of Worcester. He is the Research Lead for the School of Law and the Deputy LLB Programme Leader. His research interests include fraud and property offences, legal history and public law. Since 2009, he has published on the Fraud Act 2006 and the issue of criminalising parents who provide misleading information on school application forms. His research has been published in the Criminal Law Review and the Journal of Criminal Law. Nicola Monaghan is a Senior Lecturer in Law at the University of Worcester. She is a member of the Honourable Society of the Middle Temple and teaches criminal law and the law of evidence. She is the author of Criminal Law Directions (Oxford University Press) and Law of Evidence (Cambridge University Press) amongst other books. Her research interests include juror misconduct and compensation for miscarriages of justice and she has published articles on these areas. The Law Commission of England and Wales and the Law Reform Commission of Ireland have cited her research on jury misconduct. She also co-founded the Blackstone's National Criminal Advocacy Competition and has taught advocacy to undergraduate students since 2002. While a growing number of high profile financial crime cases have hit the headlines recently the topic of financial crime is also generating much attention amongst academics and practitioners. This series will be the first to be dedicated to the law of financial, or economic, crime and offers a platform for important and original research in this area. Books in the series will cover traditional subjects of financial crime including money laundering, terrorist financing, fraud, market abuse, insider dealing, market manipulation, tax evasion, bribery and corruption. But broader legal and regulatory issues will also be covered as well as emerging areas of concern such as the risks to stability of the financial system posed by financial crime. Emphasis will be placed on comparative approaches to the subject considering legislation across a number of jurisdictions as well as international regulations where appropriate, giving the series a truly global outlook. 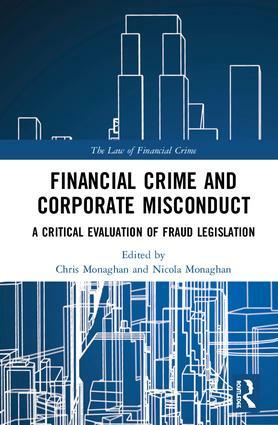 The titles in the series are primarily aimed at an audience of researchers, scholars and practitioners in the area but should also be of interest to policy makers, law enforcement agencies, financial regulatory agencies, as well as people employed within the financial services sector.